SYDNEY (Reuters) - A tsunami threat to Fiji has been cancelled, the Pacific Tsunami Warning Center said on Wednesday, shortly after a powerful earthquake struck off the South Pacific island nation, prompting many panicked coastal residents to evacuate to higher ground. 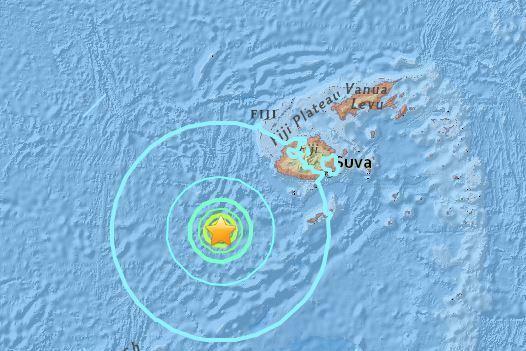 The quake, which hit at 10.52 a.m.(2152 GMT Tuesday), was centred 280 km (175 miles) southwest of Fiji's capital, Suva, at a shallow depth of about 15 km (9 miles), the U.S. Geological Survey said. It was originally recorded with a magnitude of 7.2 but was later downgraded to 6.9. There were no initial reports of widespread casualties or damage. Fiji's national disaster office issued a nationwide tsunami warning after the powerful underwater quake, leading to widespread evacuations and traffic jams. "The earthquake caused a fair bit of panic, there are cars lined up trying to get to higher ground," Jovesa Saladoka, the Fiji director of Oxfam, told Reuters by telephone from Suva. Corrine Ambler, a Red Cross worker in Suva, said on Twitter all Red Cross staff and most of the capital was "headed to higher ground". At least two aftershocks with magnitudes of more than 5 rattled Fiji soon after the quake. The Pacific Tsunami Warning Center cancelled the tsunami threat to Fiji just over an hour after the first tremor. A powerful earthquake of magnitude 7.2 struck off the island nation of Fiji on Wednesday, the U.S. Geological Survey (USGS)said. The quake, which struck at 10:52 a.m. (2152 GMT on Tuesday), was located 175 miles (282 km) southwest Fiji’s capital, Suva, at a shallow depth of 9.4 miles (15 km), the USGS said. The Pacific Tsunami Warning Centre issued a local tsunami warning and said that hazardous tsunami waves were possible and could strike the coastline of Fiji by 11:45 a.m. (2245 GMT on Tuesday). “We felt it ever so slightly in Suva,” Sune Gudnizt, head of the United Nations’ Office for the Coordination of Humanitarian Affairs told Reuters by telephone. 0 Response to "Tsunami threat passes after powerful quake hits Fiji"